An upper body portrait of a smiling youth, wearing a white shirt and metal neck ornament on a chain. 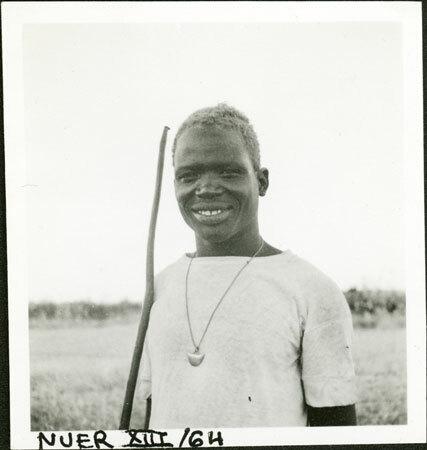 Evans-Pritchard described him in different places as both Atuot and Dinka - the Atuot were culturally and geographically integrated with the Dinka although linguistically closer to the Nuer. This youth is almost certainly an Atuot that Evans-Pritchard met during his fieldwork in Western Nuerland in 1936, and who in another image is demonstrating an Atuot dance gesture for the camera. Note on print reverse ms pencil - "4 Atwot boy" & print front border ms ink - "NUER XIII/64"
Morton, Chris. "Portrait of an Atuot youth " Southern Sudan Project (in development). 03 Jan. 2006. Pitt Rivers Museum. <http://southernsudan.prm.ox.ac.uk/details/1998.355.632.2/>.